against and thought to be impure. With today’s technology, blood typing has made these foolish rumors a thing of the past. Some of the most flamboyant patterns and shades were not thought impure in the desert but were actually sought after. One of the Abbas Pasha’s most celebrated mares was Faris Saouda, a parti-color (wildly spotted) horse. This ancient gene is not a sign of impurity but exactly the opposite. The true parti-color is not a common spotting pattern as seen today, but instead is the failure of pigmentation cells to spread throughout the body of the horse, a unique mutation occurring mostly in hotbloods. The Abbas Pasha set great store by this color and collected 11 mares with these attributes. Faris Saouda can be found in most of the bloodlines available in the U.S. today. The true parti-color is hardly ever seen today and is strictly hotblood in origin. 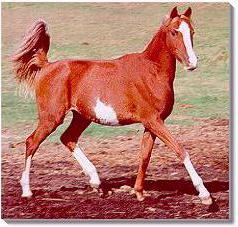 Desert Name-Ablak This color is not related to the tobiano or the overo gene groups. Appaloosa type spots in the Arabian also seem to be a throwback to the parti-color. These horses are not eligible for the Appaloosa registry, even though some could be confused with the true Appaloosa. With the exception of white markings, Arabians differ from other breeds in that they are always black-skinned. The color variance of the Arabian can be attributed to mutations of the basic hard coat colors of red, black, and bay, with grey being a phase of the white hair pattern group. White markings are a sign of domestication and differ from wild animals in that the markings are randomly placed, unlike the symmetrical markings of the zebra. There are many variations in the markings and common colors that occur within the Arabian population; some are common and some extremely rare. We will attempt to cover them here in this work. In order to comprehend the basic concepts of purebred Arabian color, it is first necessary to understand the definitions of certain color-altering factors, such as shade, sooty, and mealy. These three factors effect the hair coloration without changing skin pigment. Shade is governed by both genetic influence and environment. This influence gives the appearance of dilution without the dilution gene in some cases. Sooty is a modification that allows black hairs to intermingle with the basic coat to alter the general appearance of the color. This usually appears across the back. Sooty is also the element that turns the bay to mahogany bay. The mealy effect is caused by a single gene that is dominant and changes the hair color around the muzzle, eyes, and belly. The mealy component affects both red and black coats, changing the black to seal brown. The chestnut coat is merely lightened in these areas. of the mares he has been bred to are chestnut. 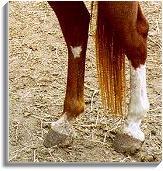 Washy bay refers to a horse that could almost appear to be chestnut as the points of the legs, mane, and tail are neither black nor chestnut but a “washy” reddish color with a few intermingling black hairs. In most cases, this washy bay is actually a bay whose black points fade with exposure to sunlight, giving the bay the misleading appearance of being a chestnut. The grey Arabian can start with any basic coat color, but is most common with dark horses. With the exception of the rose grey (a red chestnut that greys from the base coat to give it a rosy color), most greys go through several darkening phases where the horse eventually becomes near black before turning grey. It is impossible to tell what color the base coat of the horse actually was unless it was viewed as a foal. 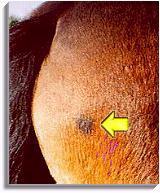 Bloody marks are distinctive large reddish patches on a grey horse that increase in size as the horse ages. They are independent of both background color and greying phases. Rarely, in a very aged horse, this coloration could appear uniformly red. This phenomenon appears to be a reversal of the greying process. The buckskin, similar to the palomino, is a lighter phase of the bay but not a true buckskin. 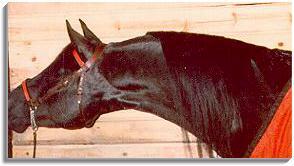 The Arabian does not carry the dilution gene and suffers no loss of skin pigment with either of these phases. The light-tailed bay with a tan-colored tail is a unique occurrence sometimes seen in young horses. 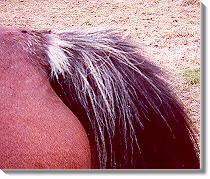 As the horse ages the black tail hairs appear until the tail is the regular black color. ABOVE: An example of "skunk tail." BELOW RIGHT: A beauty mark. Flecks or ticking at the flanks and tail base thought to be associated with the roan may be present at birth or can be developed later. These are also permanent patterns and occur in all color horses. In the white dock, there is a fall of white hair starting at the tail base. This is usually referred to as skunk tail or rabicano, and is believed to be a type of sabino gene. Belly spots and body patches can be either clean-cut, ragged-edged, or roaned-edged but all have underlying white skin. These spots are ancient in origin and can be of any size. They are present at birth and are permanent. This sabino mutation occurs when the binding effect of certain enzymes is lacking. Beauty marks are dark red or black spots that occur most commonly in the chestnut coat. They can be one or many in number, either large or small. The genetic control of these spots is unknown. 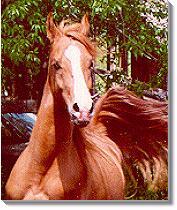 The current name for this coloration is Bend Or, after the Thoroughbred horse most noted for them. Birdcatcher spots are very rare and are associated with certain families. These random white spots occurring on any area of the body can appear at any time in life and just as mysteriously disappear. White markings can have roaned endings that appear lacy or can blend entirely with the solid coat. In this instance, the face and leg markings will be roan instead of white. that connect with the hoof. They have underlying black skin within the white marking. This also is reputed to extend into the hoof, aiding in the striped coloration of the hoof. reaches the muzzle where it abruptly extends to encompass the muzzle in part or fully. This ancient unique pattern can produce white hooks that stretch out into the jaw and into the throat. Desert Name-Sabha Dots within the blaze are dark dots with underlying black skin found within the white facial markings. They are completely separate from the outside color. Desert Name-Sa’ad The dot within the blaze is a solid color marking, usually round, and very rare when found on the forehead. The glass eye is very uncommon in today’s horses but was seen much more frequently in the desert. It has recently been associated with a form of spotting gene. The glass eye contains no pigment in the iris and appears blue. (There seems to be no vision impairment in horses with glass eyes.) 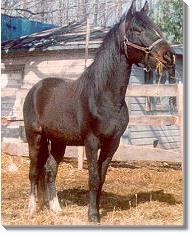 The Crabbet stallion Jeroboam was a glass-eyed horse. Arabian horses with no markings at all are extremely rare. A horse’s white markings seem to be similar to our fingerprints in that no two are really alike. In an experiment with twin embryo transplants, both twins were born identical in every way except for their white markings. This concludes that white markings are a product of the individual and have no association to purity. dun-colored fellow with a bay-type coat that could vary slightly as a camouflage measure according to the area in which he lived. If you were an artist setting out to paint this little creature and you had only the primary colors and black and white, which ones would you use? The answer is, all of them. The basic coat color of the dawn horse contained all the colors of today’s modern horses, and somewhere over the course of time, these colors separated into the glorious variations seen in the coat patterns of today. In future installments we will discuss various colors and patterns of color in Arabians and partbreds and how to achieve these sought-after goals.